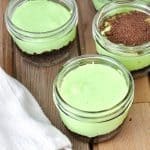 I was inspired to make these Mint Cheesecakes Jars from a post that was linked up to the Friday Frenzy last week. The post was actually for Grasshopper Cheesecake Bars from the Kitchen is my Playground. I wanted to change them up a bit so I made them with my favorite simple cheesecake recipe and few different ingredients. These were a big hit with my family, except one odd child who said they were too sweet. 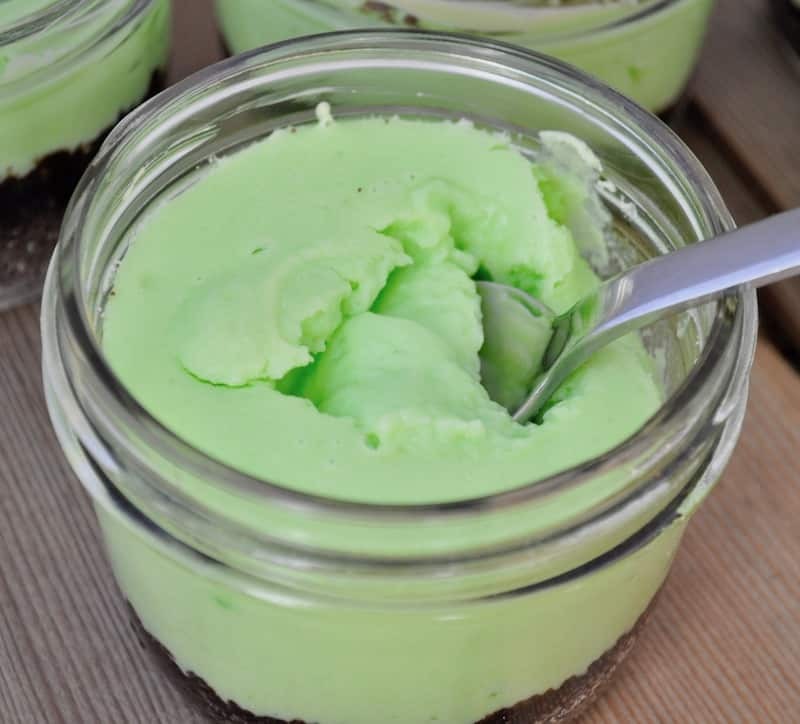 The other one suggested I make these Mint Cheesecakes Jars again for St. Patrick’s Day. Gotcha covered kid! I pin just about every single post that comes across the Friday Frenzy link party, a good reason to link up blogger friends, because I never want to miss something amazing. When I saw the Grasshopper Cheesecake bars I was like “add that to my posts for the next 6 weeks” and then made them almost immediately. I had to strike while the iron was hot, in this case while I had cream cheese left in the house. I dug up some mint extract, chocolate grahams and a little green food coloring and I was in business. I baked these in half pint jars because I like to pack desserts in jars with a lid and keep them in the fridge. That way they’re ready to roll whenver I need something to pop in a kids lunch. Or my husband’s lunch. Or for coffee hour once everyone is off to school. They’re handy and they have a lid so they are just totally portable. These look wonderful! I like the idea of a convenient way of transporting cheesecake! Thanks Denise! They are so easy and tasty. I love making things right in jars for easy transport. I have teen boys to feed! These look so yummy! I love that you found the recipe inspiration from a blogger who linked up at Friday Frenzy! That’s awesome!! SO yummy! I’m trying to use one recipe a week as an inspiration and then blog about it. These would be fun for St. Paddy’s day- I have one child that won’t eat chocolate…seriously. If I didn’t know better…but he’s mine! If only B.O.B. Bob liked the combination of mint and chocolate. I’d make this in a heartbeat! 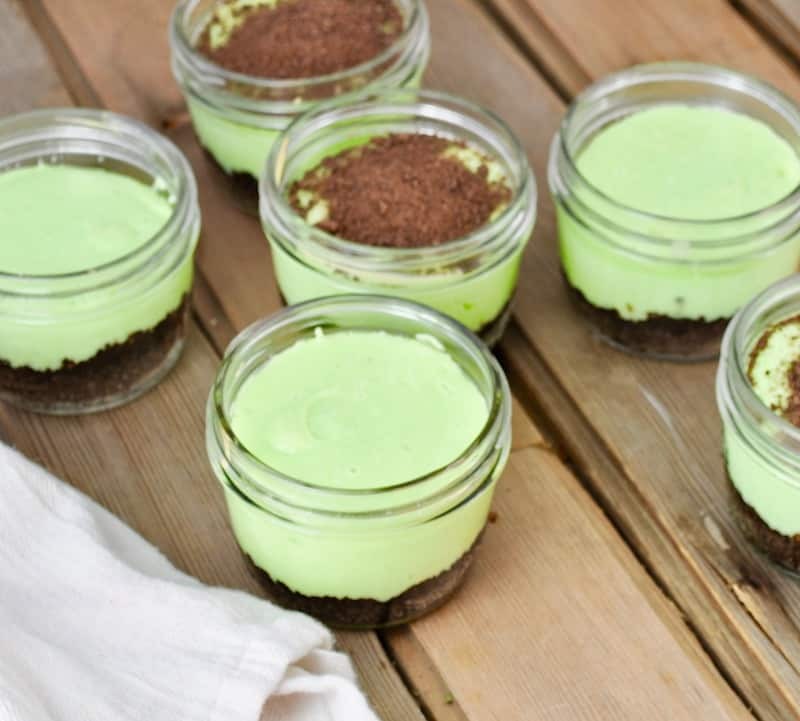 These are adorable and chocolate + mint is one of my favorite combos!